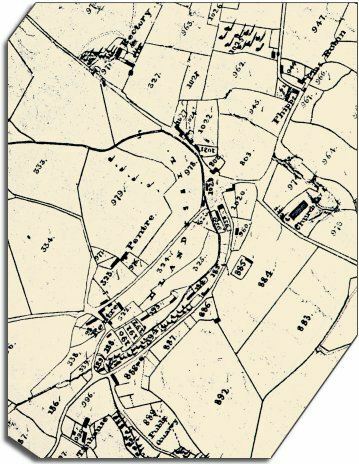 The map below is based on a detail from the tithe map for Llandysul parish. Although the original is tattered and faded it gives us a picture of the village in the early years of Queen Victoria's reign. We can see from the map that there is a scatter of smaller cottages near the stream, especially at Pentre. The bigger houses like the Rectory and Tan House stand apart with more space around them. This looks like a typical small rural Montgomeryshire community. Most of the people living here would have made their living on the land in some way. 2 dressmakers and a seamstress, 2 shopkeepers, 10 shoemakers, 9 charwomen (cleaners), 6 millers, 8 wheelwrights, 8 blacksmiths, 3 tailors, 2 sawyers, 2 carpenters, 2 surgeons. There were also a number of people working in the production of wool - fullers, carders and slubbers. The Bryn Derwen turnpike gate was in the responsible hands of Margaret Rheese, aged 15. The original map was not aligned with north at the top, so we have turned it round a little to make it easier to compare with later maps. One other feature of rural areas with a small population is the number of people who did more than one job to make ends meet. John Edwards of Llandysul was a publican, shopkeeper and shoemaker, and George Roberts of Abermule Mill was a miller, maltster, and farmer.